Producing meaningful, long-term energy savings in IT operations depends on a strategic planning and execution process. 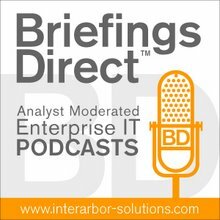 The latest BriefingsDirect podcast discussion therefore targets significantly reducing energy consumption across data centers strategically. In it we examine four major areas that result in the most energy policy bang for the buck -- virtualization, application modernization, data-center infrastructure best practices, and properly planning and building out new data-center facilities. To help learn more about significantly reducing energy consumption across data centers, we welcome two experts from HP: John Bennett, worldwide director, Data Center Transformation Solutions , and Ian Jagger, worldwide marketing manager for Data Center Services. The discussion is moderated by me, BriefingsDirect's Dana Gardner, principal analyst at Interarbor Solutions. Bennett: We, as an industry, are full of advice around best practices for what people should be taking a look at. We provide these wonderful lists of things that they should pay attention to -- things like hot and cold aisles, running your data center hotter, and modernizing your infrastructure, consolidating it, virtualizing it, and things of that ilk. ... We know very well that modern infrastructure, modern servers, modern storage, and modern networking items are much more energy efficient than their predecessors from even two or three years ago. ... If we look at the total energy picture and the infrastructure itself -- in particular, the server and storage environment -- one of the fundamental objectives for virtualization is to dramatically increase the utilization of the assets you have. We're talking about collapsing infrastructure requirements by factors of 5, 6, or 10. You're going from 10 or 20 old servers to perhaps a couple of servers running much more efficiently. And, with modernization at play, you can actually increase that multiplication. ... Each customer has a different situation from the next, depending on how the infrastructure is laid out, the age of the data center, and even the climatic location of the data center. All of these have enormous impact on the customer's individual situation. ... If we're looking, for example, at the situation where a customer needs a new data center, then it makes sense for that customer to look at all the cases put together -- application modernization, virtualization, and also data center design itself. Here is where it all stands to converge from an energy perspective. Data centers are expensive things to build, without doubt. Everyone recognizes that and everybody looks at ways not to build a new data center. But, the point is that a data center is there to run applications that drive business value for the company itself. ... One of the smartest things you can actually do as a business, as an IT manager, is to actually go and talk to your utility company and ask them what rebates are available for energy savings. They typically will offer you ways of addressing how you can improve your energy efficiency within the data center. Bennett: What we are advising customers to do is take a more complete view of the resources and assets that go into delivering business services to the company. It's not just the applications and the portfolio. ... It's the data center facilities themselves and how they are optimized for this purpose -- both from a data center perspective and from the facility-as-a-building perspective. ... For customers who are very explicitly concerned about energy and how to reduce their energy cost and energy consumption, we have an Energy Analysis Assessment service. It's a great way to get started to determine which of the best practices will have the highest impact on you personally, and to allow you to do the cherry-picking. For customers who are looking at things a little more comprehensively, energy analysis and energy efficiency are two aspects of a data-center transformation process. We have a data center transformation workshop. Jagger: The premise here is to understand possible savings or the possible efficiency available to you through forensic analysis and modeling. That has got to be the starting point, and then understanding the costs of building that efficiency. With increased attention being placed on the environmental impact that organizations have, more C-level executives are waking up to the importance and impact of their organization’s environmental footprint. Being environmentally responsible does not need to come at a cost to the organization. In fact, incorporating environmentally responsible practices can help the organization save costs. As far as i learned from the interview downloaded byabbmp3.com/ HP has developed a five-step approach to how organizations can save money while doing their part to conserve the environment.